It’s hard to get a more straightforward name that is so apt in its descriptive prowess than a woodpecker. They are a beautiful and unique species in the bird kingdom. Drill into trees to find food. Extending, curled tongue covered with barbs and sticky saliva, much like in an anteater. Short legs with sharp claws for easy clinging to tree barks. Furthermore, woodpeckers enjoy a protected legal status by both federal and state laws within the U.S., which means that is forbidden to use them as a game bird, unless issued a special permit by the U.S. Fish and Wildlife Service. If woodpeckers would constrain themselves to drilling the barks of trees, their negatives might not even be worth mentioning. Alas, as human civilization spread, animals adapted their behaviors to what can be found in the changed environment. As previously noted, woodpeckers not only drill into trees for food, but also for communication, territorial boundaries, and mate-finding. That means they will seek any resonant surface that can provide the rhythmic drumming, no matter if it provides food or not. In nature, these surfaces would be dead or live tree trunks, but in the context of human habitation, the rhythmic drumming can be served by utility poles, buildings, and especially wooden houses in more rural areas due to their excellent capacity to amplify resonance. Woodpeckers can also drum into antennas, satellite dishes, chimney caps, and downspouts. In addition to suffered structural damage of all of these objects, the timing of the woodpecker drumming is quite unfortunate as well. As it mostly incurs at dawn, it could cause quite a disruption of peace. Overall, it is to be expected that the naturally evolved behavior of woodpeckers extended to human structures, but can we really blame them as we invaded every natural habitat on the planet? However, there is a reason that have been legally protected – woodpeckers are beneficial to the environment due to their rapacious appetite. Woodpeckers feed both on the tree sap and the insects that are attracted by the sap, but most importantly, woodpeckers feed on bark lice and other wood boring insects that would otherwise devastate trees if left to their own devices. Furthermore, woodpeckers would take care of your garden pests as well: ants, grubs, beetles, flies, crickets, grasshoppers, spiders, and wasps. We are talking about thousands of insects per day, performed by a single Flicker woodpecker. As you can see, in the end, it always comes down to natural balance. The benefits of woodpeckers not only extend to their pest-clearing and tree-preserving abilities, but their unique features, quite apart from all other birds, is enough of a reason on its own. And as the naming of North American woodpeckers suggests, they are also aesthetically pleasing as well, wide a colorful spread of features and sizes. 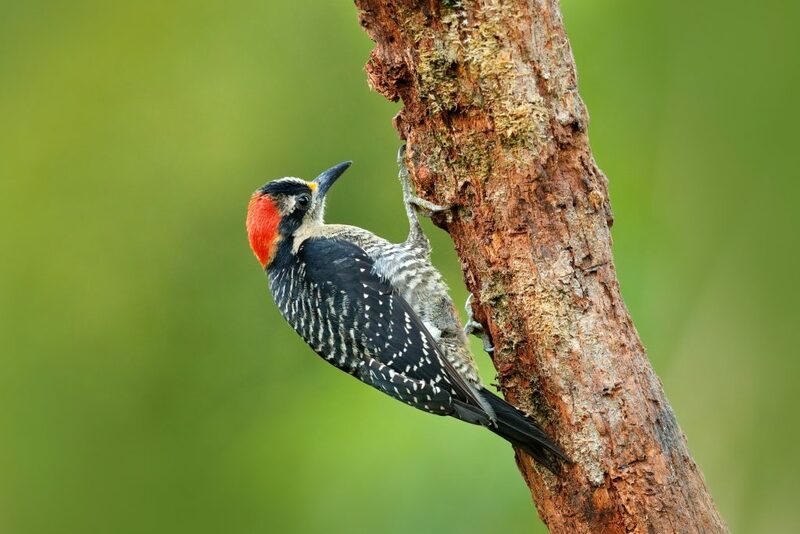 If you are determined to add woodpeckers as your new neighbors for birdwatching from your backyard, or to get their help in clearing your garden from insect pests, you can offer them two things they need the most – food and shelter. Although woodpeckers have an indiscriminate palate, as they will engage in consuming insects, acorns, fruit, sap, nuts, pine seeds, and berries, you can effectively entice them by smearing bird suet on the nearest tree barks – their primary focal point for food and communication. Bird suet is a fatty version of your regular birdfeed, calorically dense and nutritious. You can either buy it in a pet store, order online, or make one yourself as we explained in one of the previous articles (insert suet article link). There are also commercially available suet cages to be hanged from branches, which is ideal for woodpeckers as they like an ample perching space. Or you can just hang single suet cakes. One of the most favorite woodpecker foods is definitely the black oil sunflower seed. Mix it with grapes, apple chunks, raisins and cracked corn, and you will create a highly-nutritious and delicious woodpecker superfood. Such food is especially important for two species of woodpeckers that don’t migrate to the south during the winter – Northern Flicker and Yellow-Bellied Sapsucker. Smearing your regular peanut butter on the tree barks is also one of the most effective and convenient ways to attract woodpeckers. Peanut butter in of itself can be considered a superfood due to its high caloric value, fatty content, and a full spread of minerals and vitamins. After all, there is a reason why peanut butter is so hugely popular among humans and making bird food with peanut butter is easy. Combine these food ideas with more permanent forms of shelter, and you have yourself a winning combination when it comes to attracting woodpeckers. Like owls, woodpeckers like to have their homes in crevices, which would entail attaching a woodpecker birdhouse to a tree. You can consult a birdhouse dimension chart for the particular kind of woodpecker you would want to attract, and one that is known to habituate your geographical region. However, the best form of woodpecker housing, the one they are used to and are most attracted to, are tree snags. A tree snag is simply a term given to dead or dying trees, or even a tree stump. Such disintegrating dead trees are ideal for woodpeckers to excavate their new shelters and nesting holes. In fact, they will have a strong instinct to first select them, over an expensive, commercial woodpecker birdhouse. Their excavation of rotting trees for roosting and nesting purposes will occur in spring, usually late April and May. You can also build a woodpecker house or buy one commercially. The size of the house will depend on which species of woodpecker you are trying to attract.